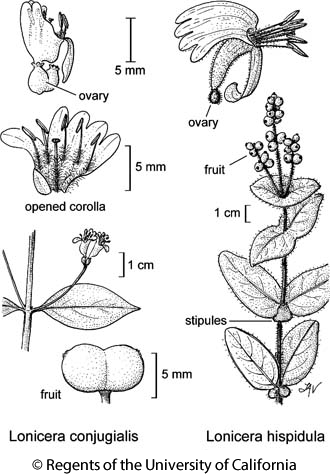 Habit: Erect, slender, 6--18 dm; herbage puberulent. Leaf: 2--8 cm; blade elliptic to round, base +- tapered, tip round to acute. Inflorescence: flowers paired; peduncle 14--30 mm, slender; bracts 0 or minute. Flower: calyx limb 0 or inconspicuous; corolla 4--7 mm, strongly 2-lipped, dark red, hairs 0 or sparse, upper lip erect, shallowly 4-lobed, lower lip downturned; anthers 3 in upper lip, 2 exserted from deepest corolla sinuses; ovaries (and fruit) fused generally > 1/2, style hairy well below stigma; stamens, stigma exserted. Fruit: pair fused generally > 1/2, 6--8 mm, bright red, translucent. Citation for this treatment: Charles D. Bell & Lauramay T. Dempster 2012, Lonicera conjugialis, in Jepson Flora Project (eds.) Jepson eFlora, http://ucjeps.berkeley.edu/eflora/eflora_display.php?tid=31497, accessed on April 21, 2019. NW, CaR, SN, MP; Markers link to CCH specimen records. Yellow markers indicate records that may provide evidence for eFlora range revision or may have georeferencing or identification issues. Purple markers indicate specimens collected from a garden, greenhouse, or other non-wild location.